APPSC Recruitment 2019:- Job Seekers, Who are searching Latest Job in Andhra Pradesh. We have suggested to them that they can check below APPSC Exam Calendar 2019. By the Help of APPSC Exam Schedule, 2019 applicants must aware regarding their APPSC Latest Vacancy 2018-19. 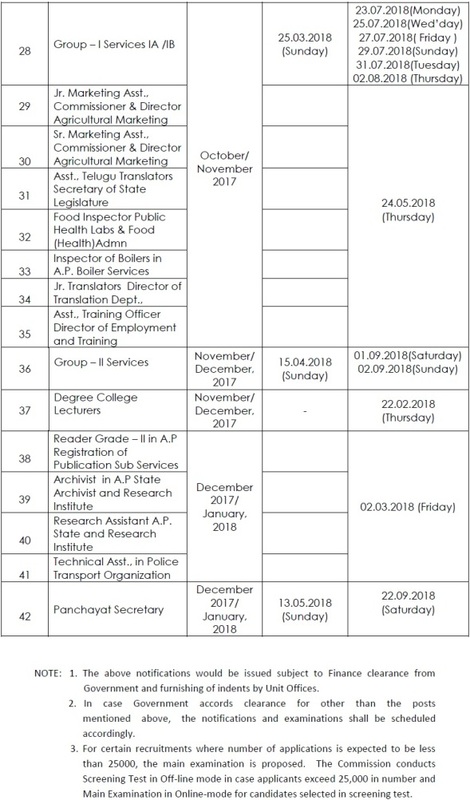 Andhra Pradesh Public Service Commission has released the Tentative APPSC Exam Calendar 2019. There are many Job Seekers, who are finding jobs in Civil Services and preparing for APPSC examination to get recruited in PSC. The Commission charges this exam in order to recruit the candidates for filling up vacant vacancies of Group 4, Group 2, Group 1, ASO, AEE posts etc. Andhra Pradesh Public Service Commission releases various vacant posts for the eligible candidates year wise. All the candidates belong to Andhra Pradesh state and searching latest Govt Recruitment 2019 in APPSC then they can visit the official site or our page. Firstly they read official notification carefully then fill the online application form in APPSC. Job Seekers, who are searching for APPSC Exam Calendar Date Scheme, can download APPSC Group Exam Time Table by the help of this page. Candidates can get entire details regarding APPSC Exam Calendar 2019 by visiting through our post. Mainly the recruitment scheme includes preliminary and mains examination included the personal interview. Yearly, Andhra Pradesh Public Service Commission charges recruitment exams and departmental tests to fill the available positions in various departments. 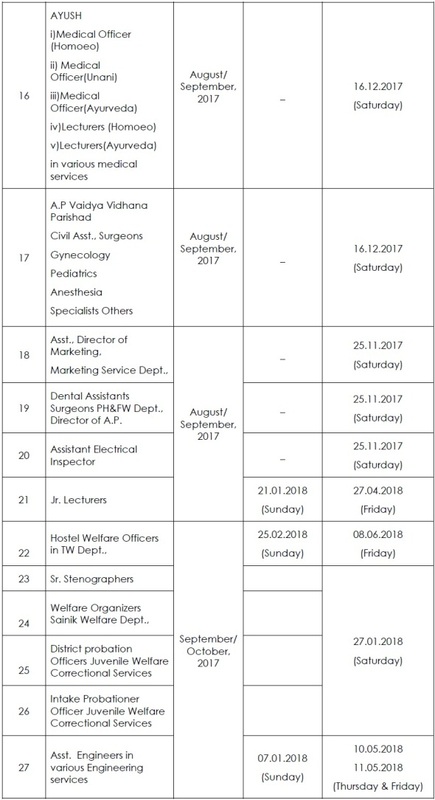 Candidates can check the Andhra Pradesh Public Service Commission APPSC Exam Calendar Notification 2019 –20 by below-given table. APPSC charges test/exams for different types of enrollment exam and various departmental exams for an intention of promoting them by providing job placements suitable for them. Generally, the recruitment method contains preliminary/mains examination followed by a personal interview. Interested applicants for more updates in concern of APPSC Exam Notification 2019 can keep connecting our page. Notification No.29/2018, Date.31/12/2018 – Deputy Executive Information Engineers in A.P. Information Service. Notification No.28/2018, Date.31/12/2018 – Assistant Inspector of Fisheries In A.P. Fisheries sub-service. Notification No.27/2018, Date.31/12/2018 – Group- I Services. Notification No.26/2018, Date.31/12/2018 – Lecturers in Government Degree Colleges in A.P Collegiate Education Service. Notification No.25/2018, Date.31/12/2018 – Group- II Services. Notification No.24/2018, Date.31/12/2018 – Fisheries Development Officers in A.P. Fisheries Service. Notification No.23/2018, Date.31/12/2018 – Lecturers in Government Polytechnic Colleges (Engineering and Non-Engineering) in A.P Technical Education Service. Andhra Pradesh Public Service Commission (APPSC) was established in the year 1956, which later changed with the formation of the State of Andhra Pradesh on November 1st in the same year. It was changed by merging the Andhra and Hyderabad PSC and one of the main functions of the commission is to hold examinations and interviews for selection to many services of the State. Andhra Pradesh Public Service Commission (APPSC) is one of the government PSUs authorities. APPSC recruits various aspirants every year for filling many positions in various departments. APPSC charges written exam and Interview to fill these vacant posts. To get Jobs in APPSC, you need to crack written examination as according to APPSC Exam Date, then qualified applicants will go for an interview process. Authority Name: Andhra Pradesh Public Service Commission (APPSC). 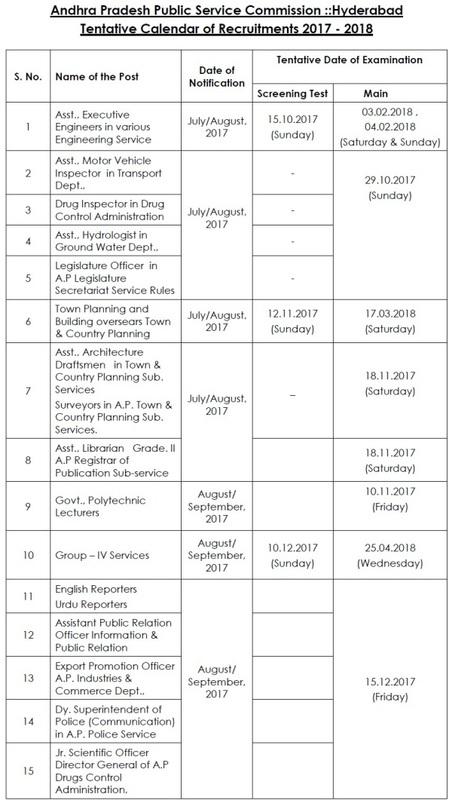 Article Category: APPSC Exam Calendar 2019-20. Time Table Status: Available Now. Every year the APPSC authority organize the many recruitment exams. In this page, you can also analyze the Andhra Pradesh PSC Exam Schedule 2019 Recruitment like notification dates, exam dates, eligibility, steps to apply and other official notification details. The participators can stay tuned with our web portal for information of APPSC Exam Calendar 2019. 7 Asst., Architecture Draftsmen in Town & Country Planning Sub. Services Surveyors in A.P. Town & Country Planning Sub. Services. Andhra Pradesh Public Service Commission (APPSC) charged the annual groups exams and recruitment yearly. Candidates can check all useful details with the help of AP PSC Exam Calendar 2018-19, which are useful in APPSC Latest Vacancy. APPSC declare this calendar on the lines of Union Public Service Commission (UPSC), which every year declare the examination calendar. There are total 42 exams given in this calendar like Group 1, Group -2, Group -3, Panchayat Secretary, AEE, Degree Lecturers, Junior College lecturers, MVIs etc. It includes the expected dates of notifications, last date to apply, dates of examinations. Download APPSC Groups Exams and Recruitment Tentative Annual Calendar for 2019 PDF Dates. The Aspirants who will wait for the Andhra Pradesh latest government jobs 2018 can start analyzing the APPSC Upcoming Jobs 2018 from the official site. Candidates must follow some easy steps for downloading the Time Table/APPSC Exam Calendar from the main website. Firstly visit the APPSC website that is given above. Then search the AP PSC Exam Calendar 2019-20 tab & click on it. Exam calendar is available in PDF format. Download the PDF and take printout.